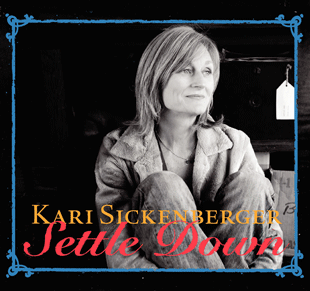 My solo CD, Settle Down, is available and you can purchase it here. Kari has been leading singing classes and workshops for more than a decade. Kari draws on her vast experience as a Spanish and English teacher and her lifelong love for and experience with music to create a safe and encouraging environment for new and experienced singers alike. Just bring along your love for singing, and everything will fall into place in our safe and supportive circle of song. Welcome to The Stable, Sisters! We began at, and as, Polecat Creek, and we have now graduated to 38 acres on Big Creek ~ a beautiful, woodsy and watery spot in Stokes County adjacent to Hanging Rock State Park where nature and comfort combine to create a perfect workshop space. Emphasis will be on the voice and its connection to ourselves, each other, and the natural world. $325 Includes compilation CD, lyric sheet packet, a bed (or you may pitch a tent), and all meals. Just BYOB, some paper for songwriting, and your sense of adventure and play. I’ll be co-teaching a Country Harmony class with my buddy, Vollie, McKenzie, and also teaching Carter Family songs. ♫♫ In this workshop we will explore the harmony sounds of some of the best brother and/or sister duets (and maybe some trios) ever recorded. We’ll figure out some of the secrets (beyond genetics) that made them sound so good, and we’ll make our own harmonies with our own voices, the siblings leading the way. Weekend includes all meals, accommodations, and singing workshops Friday – Sunday. Meals will be organic and locally based. Special diets happily accommodated. Friday Sept 27: Dinner will be ready at 6pm, rooms ready and open at 4pm. Come early and settle in on the back porch….and the singing begins at 7:30! 8pm Concert, then more singing! Sunday Sept 29: 8:30-9:30 Brunch 10-12pm Gospel singing (BYOG). After that, the Floyd Country Store hosts an Old Time Jam from 1:30-3:30. We have space for 6-8 to stay in the house, and/or there is space to camp. Spaces are available for local folks to join as well !!! **This weekend is open to Women AND Men. Come sing with us! Please email Stephanie at 333stephaniewolf@gmail.com to register or if you have questions. Space is limited. $145 deposit holds your spot. Remainder due September 1st. Join us for a week of heart-centered singing in traditional Mexican and American genres – Conjunto, Mariachi, Polka, Norteño…. And Country and Folk from north of the border too! We share much in common with our southern neighbors, and while visiting their beautiful country, why not learn and sing some of their beautiful songs – and share some of our own? NO Spanish language aptitude or singing expertise required….only a willingness to try, and an open heart. Some songs will be in Spanish and some in English, but ALL will be achievable, meaningful, and fun to sing. CD and lyric sheets provided. The week will be peppered with lots of free time to explore San Miguel, a World Heritage Site and a culturally and historically rich gem of a city in Central Mexico. We will share 3 neighboring homes and hold workshop/classes on the rooftop terraces, or in the beautiful, sunny living rooms, offer optional excursions, yoga, and Spanish Classes, and provide many fabulous meals (see schedule below) – subject to slight changes. Stephanie will serve not only as caterer for most meals but also as all-around host and facilitator of activities with many ideas and suggestions for those who want to venture out on their own or as a group. Evening song circle on the rooftop! Monday ~ Full Breakfast provided 8-9, 9:30-11am walking tour of our neighborhood, parks, and other places of interest to help you get oriented in San Miguel. Tuesday ~ Full Breakfast provided 8-9am. Singing 9:30-11:30. Spanish class 11:30-12:30. Free afternoon~ flea market? Fabrica Aurora, Botanical Gardens etc..
Big Fancy Dinner and Music on the town (included)!! 6:15pm Sunset Group dinner reservation in Centro (self pay) Mariachi bands/karaoke?.. Sunday ~ Breakfast provided 8-9am Sunday Gospel 9-10:30am ¡Adios, Amigos! $250 non-refundable deposit saves your spot. ½ remaining balance due October 1st and Balance due December 15. (payment plans available!) Cancellation policy: All payments non-refundable but YES-transferrable! Join us for a day of singing songs from the Piedmont – IN the Piedmont. This culturally diverse region of NC has produced an array of traditional music, from Blues to Bluegrass, and much in between. We will explore some of these styles and sing some great songs from our very own stomping grounds (Kari resides in Asheville but is originally from Greensboro). Harmonies will be developed. Voices will be honed. Good food will be eaten. Sing San Miguel presents: ¡Canto del Corazón! The week will be peppered with lots of free time to explore San Miguel, a World Heritage Site and a culturally and historically rich gem of a city in Central Mexico. We will share 2 large, neighboring homes and hold workshop/classes on the rooftop terrace or beautiful, sunny living room, offer optional excursions, yoga, and Spanish Classes, and provide most meals (see schedule below) – subject to slight changes. OR Workshop and meals only (find your own accomodations in San Miguel): $725 pp. $150 non-refundable deposit saves your spot. (payment plans available!) Cancellation policy: All payments non-refundable but YES-transferrable! A singing weekend at Folly Beach, SC (google: 510 West Ashley) hosted by Leigh Pettus and Catered by Stephanie Wolf. Join us for a weekend of singing more songs of love, and songs of more love, in a big, beautiful, Deltec beach home just across the street from the Ocean. No voice training or experience necessary to participate in this circle of song – just a desire to sing and share with kindred spirits and loving hearts. We will learn new songs, work on harmonies (if you’d like to) eat good food, and meet new friends. Come! – any time after noon. You are on your own for dinner. Cost: $270 per person includes shared room lodging with linens (2-3 people per room,) 2 breakfasts, catered lunch and dinner Saturday, all workshops with lyric sheets, compilation CD including the songs we learn, and new friends. Send non-refundable $50 check to Leigh Pettus 143 Avondale Ridge Road AVL, NC 28803. Non-refundable but yes-transferrable balance of $220 due by January 2.